Michael Kors has launched Michael Kors for Men Extreme Blue. Extreme Blue is a flanker to 2014's Michael Kors for Men. Michael Kors Extreme Blue: For the man who has no limits and knows no bounds. A new definition of modern urban masculinity with a dynamic tension of sleek freshness and sensual musks. 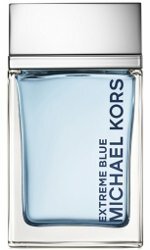 Michael Kors for Men Extreme Blue is available now at Macys, in 75 and 125 ml Eau de Toilette. Is Blue the Oud of mass merchant fragrances???? Mancera Aoud Blue Notes, Robin. Yeah, probably. He has a new trio for women coming too, looks equally meh. I am sorry, that bottle is way too pastel for the juice to be extreme….